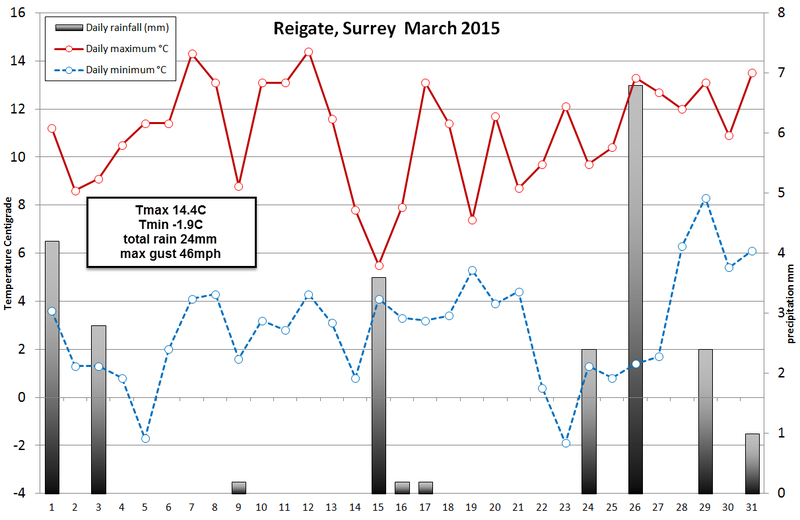 Anticyclonic conditions controlled a good chunk of March bringing a lot of dry weather to Reigate. Total Reigate March rainfall of 23.8mm is around half of that expected from the long term average for March recorded since 1873. Whilst March rainfall this year was low it was not outside the “normal range” with mean monthly rainfall for March in South East England being 49.8mm and the mode (most frequently occurring) at a relatively dry 38.7mm. March 2015 turns out to be the 36th driest year since 1873, the lowest being 1929 with a paltry 2mm of rainfall. So March 2015 was dry but not super-dry! With high pressure around March was sunny and not terribly windy, especially through the middle month. Mid-Month the temperature dipped notably (see top chart) as a slack easterly set up with the high moving over Scandinavia. It was not a beast from the east because the continent was warm and there was no really cold air available. The slack conditions finished at the end of March, however, as a significant NW gale blew across the UK. This broke our daily wind run record at 305.4 miles. Wind run is the “fetch” or distance that the wind has travelled passing a point during the day. Imagine a balloon drifting in the wind during the day… how far would it travel? This is the wind run. The NW wind also turned lorries over on motorways further north, gusting over 70mph in places. 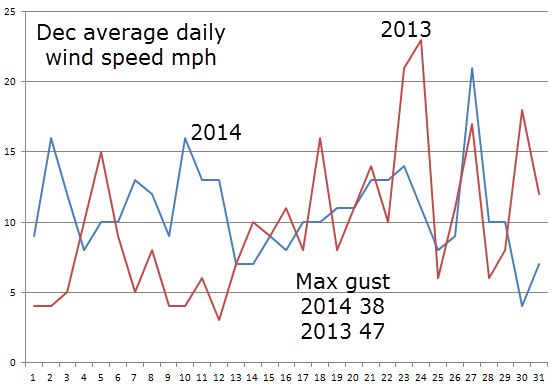 In Reigate the max gust was 46mph, pretty strong but with no leaves on the trees it did not cause damage. 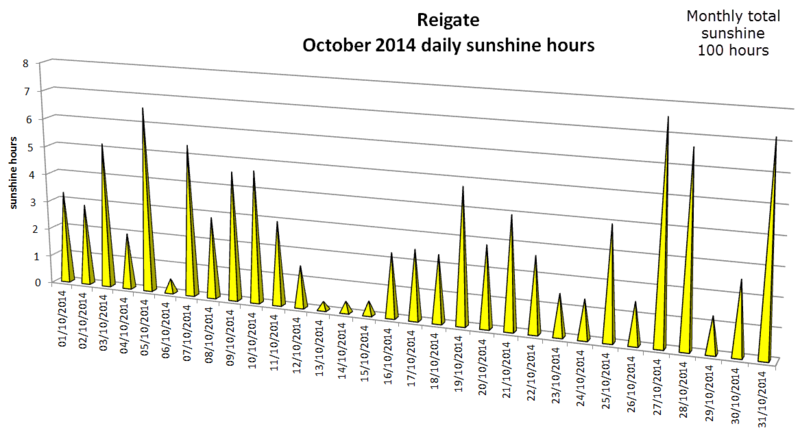 143.2 hours of sunshine in Reigate exceeded the long term average. 2015 overall is above the long term CET average but not by much. Nevertheless, as a moderate El Nino is set to start properly this summer it is likely that 2015 will be break more temperature records globally as a hot year overall for the planet. All our weather data can be downloaded from the data page here. 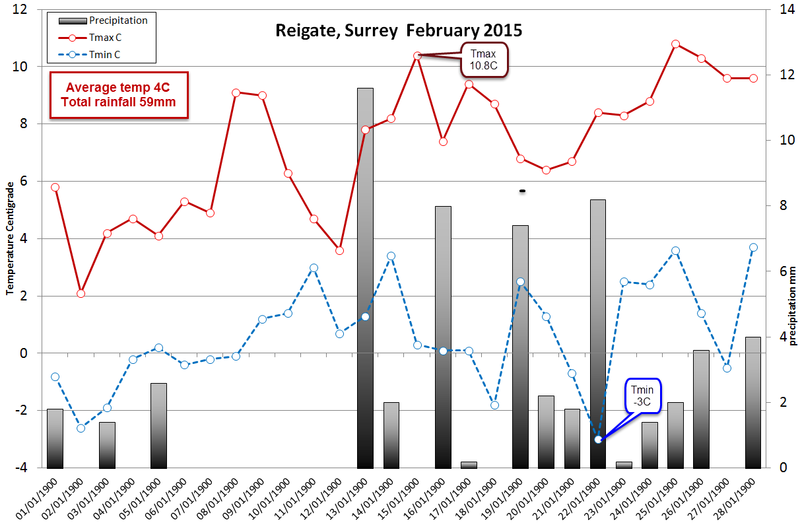 February was around the long term average at 4C in Reigate. The CET stood February at just 0.3C above the long term average. After an intially cold start to the month the temperature rose. 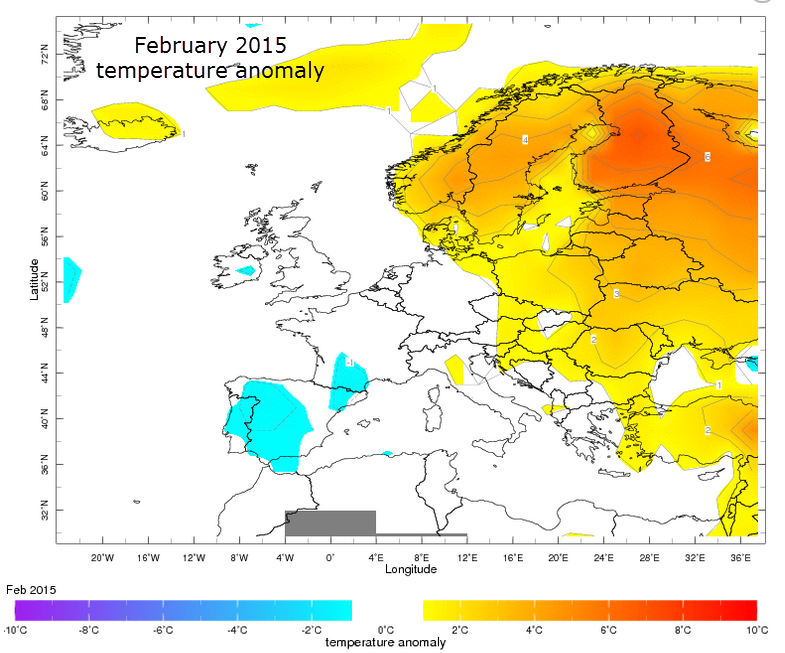 Overall February came out around average temperature but note the much warmer continent. A notable cirrostratus halo occured around moon on 02 Feb and this accompanied by some brief excitement over a snow band moving south down the eastern side of the country. This band delivered an insignificant snow flurry on 03 Feb, overnight, with a cm or so of briefly lying snow that melted rapidly during the morning. Models threatened easterly winds on occasion but this didn’t arise. 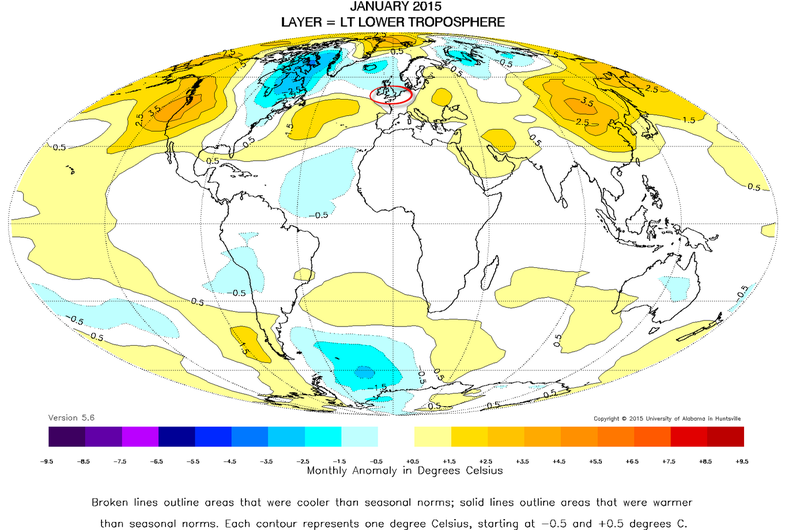 In any case Europe and the continent experienced a warmer than average month so the deep continental cold was not available. In fact after another brief flirt with snow at the beginning of the month, the temperature climbed through the middle of the month with westerly influences with temperatures exceeding 10C overnight on occasions. Rainfall 58mm was just a little below average and sunshine hours, at 90 hours, was about average. January was mostly under the influence of an occasionally strong westerly and NW airstream with some stormy weather for the NW of the UK but, predictably, Reigate and the SE was sheltered from most of the weather action and our rainfall total was about on the long term average for the South East at 69mm. This was, of course, considerably less than the 183mm rainfall last January 2014! 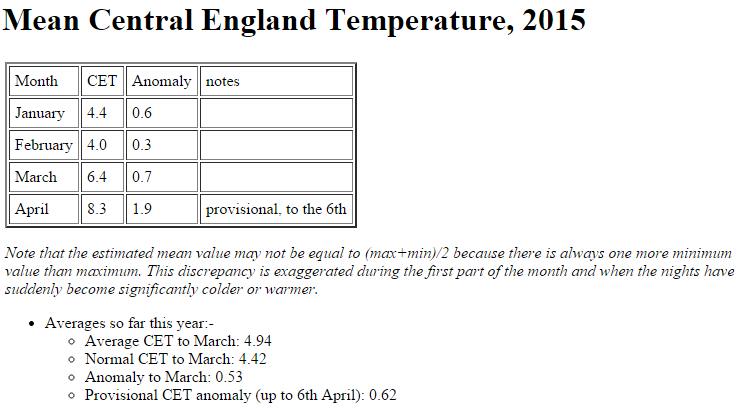 Overall, January was just about average temperature in the UK. 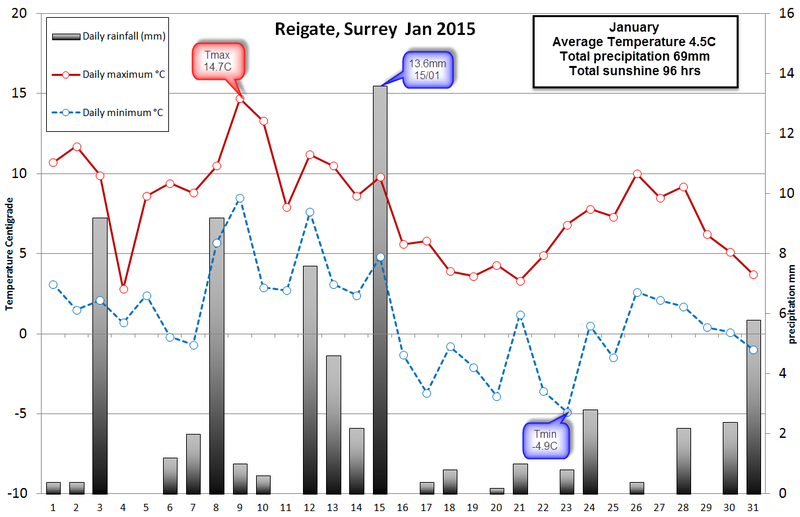 This average hides the variation though… the start of January was extremely mild with some very warm Tmax temperatures early in the month reaching nearly 15C in Reigate. The end of January was considerably colder than average although nothing extreme. The end of January cold snap ran into the first week of February. During this period Reigate saw temperatures drop modestly below average and we experienced 3 spells of modest wet snowfall, albeit lying snow from night time falls rapidly melted by early morning and the lowest temperatures we a mere -4C. Reigate experienced one notable but brief “thundersnow” event on the afternoon of 29 Jan. This caused some local traffic disruption. The cause of our swings in weather a neatly summarised in the mean monthly sea level pressure and 500hPa anomaly chart from the JMA. Here you can see the building high pressure over the Azores towards Iceland and the low pressure to the North and NE nudging towards Scandinavia. It is this configuration of building ridge in the Atlantic and LOW over Scandinavia that eventually brought our modified “Arctic blast” through the last week of January. As is normal for an Arctic airmass the SE of England away from the North Sea coast of Kent rarely sees any prolonged snowfall and this was the case. An interesting feature developed on the 29/01/2015 within the Arctic airmass: a polar low may have spun up and moved South through the Irish Sea. This was controversial and not accepted as a true polar low by everyone but it seemed to have many of the characteristics. A post on this polar low can be found here. The evolution of the January 2015 cold snap was interesting because it was initiated by an unusually cold and unstable NW airstream on the back of a deep low that crossed Scotland. The NW airstream was unstable enough to bring the thundersnow event to Reigate. 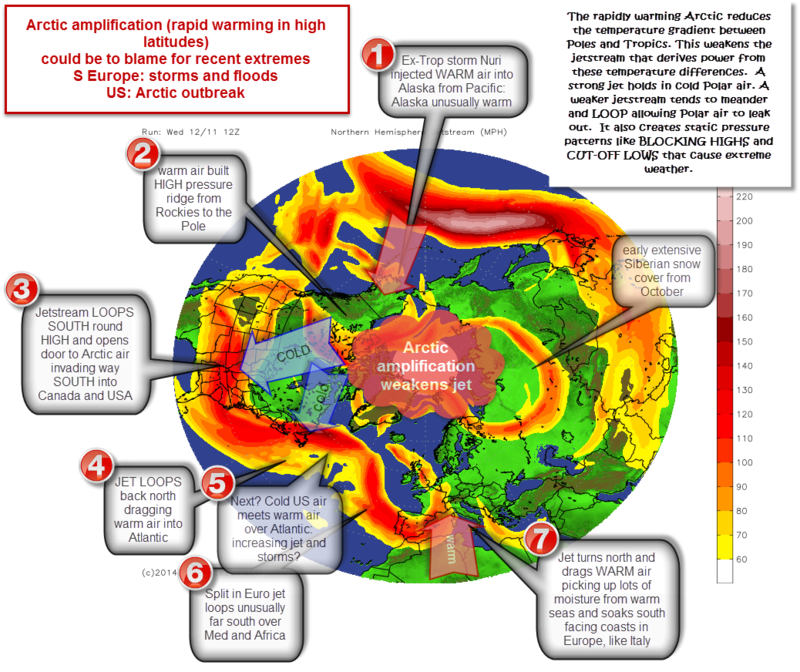 Oddly the original NW “blast” from Greenland pushed through so quickly that a lot of polar maritime returning and tropical maritime air was secluded in the low core over Scandinavia. It was this secluded / occluded warmer airmass that a) probably contributed to the polar low feature and b) modified the Arctic blast and , at least initially, made it much less cold than is usual for such an airmass direction. It took several days for any truly cold air to reach the SE of England and, even then, 850hPa temps never fell below -6 or -7C. The CET for January was nearly 1C above average for the long term average, quite a lot more than the MetOffice. As can be seen from the chart below this January was not exceptionally warm, being moderated by the cold snap at the end of the month. Only 6 of the last 20 years have come out colder than the long term CET average. Globally January was +0.35C above the long term (30 year) average temperature. The northern hemisphere was +0.55C above the long term average. 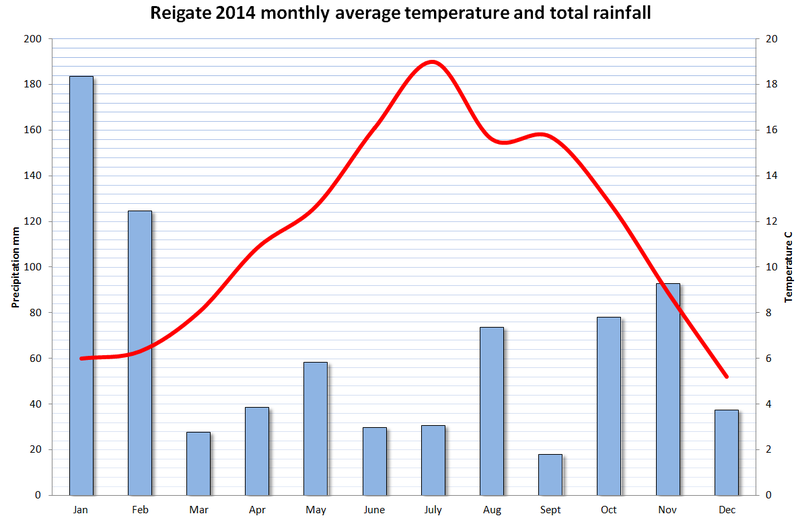 2014 weather in Reigate, like the rest of England and Wales, broke some records for rainfall and temperature but in quite different ways. To compare with 2013 visit here. 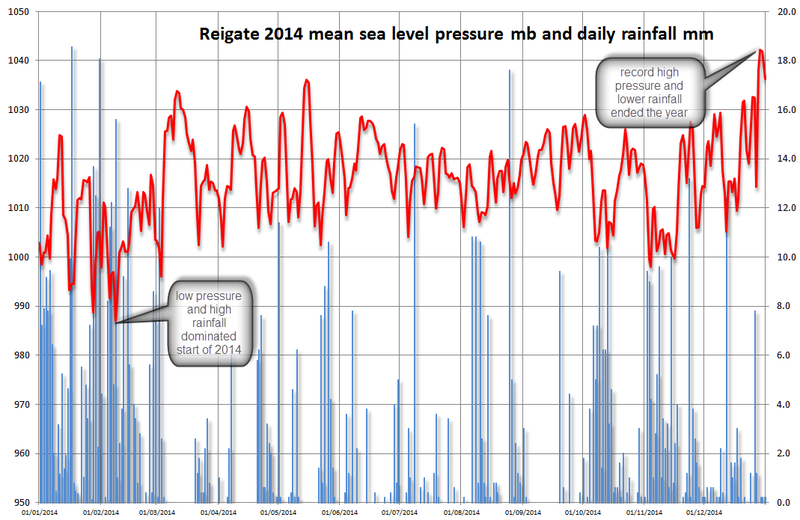 The annual summary chart (top) shows that Reigate had an exceptionally wet start to the year with January being the wettest on record (MetOffice) with over 180mm of rain (see chart above). The annual total rainfall for Reigate was 931.8mm which is above average for the area and well above the 2013 annual rainfall total of 654mm. 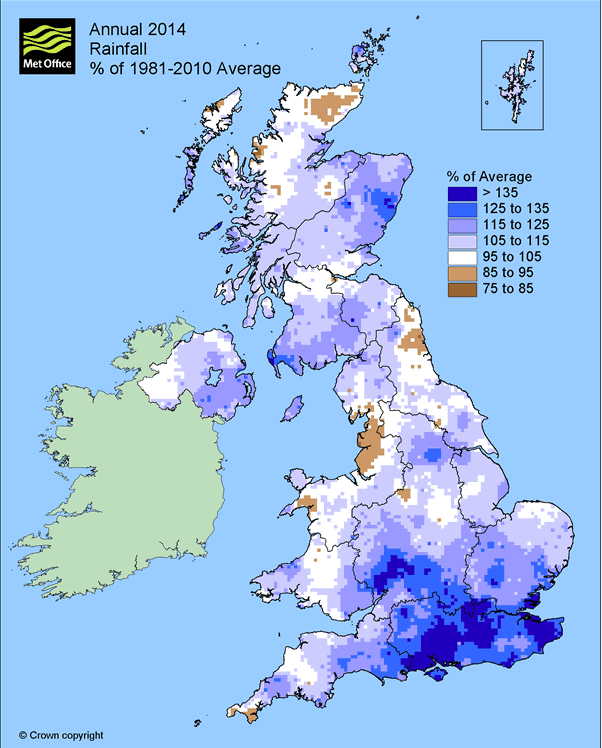 The rainfall record that fell in 2014 was for the highest January monthly precipitation total since accurate UK rainfall records began in 1873, exceeding 180mm in Reigate and the SE. The January rainfall record fell in a winter that will be remembered for being exceptionally stormy in the SE, beginning with St Jude storm in October 2013 and persisting with numerous Atlantic storms battering the west coast and delivering high rainfall totals and significant flooding events across the SE, including our own River Mole and impacting Gatwick airport. This blog covered numerous accounts of flooding and storm damage throughout that exceptionally stormy winter. 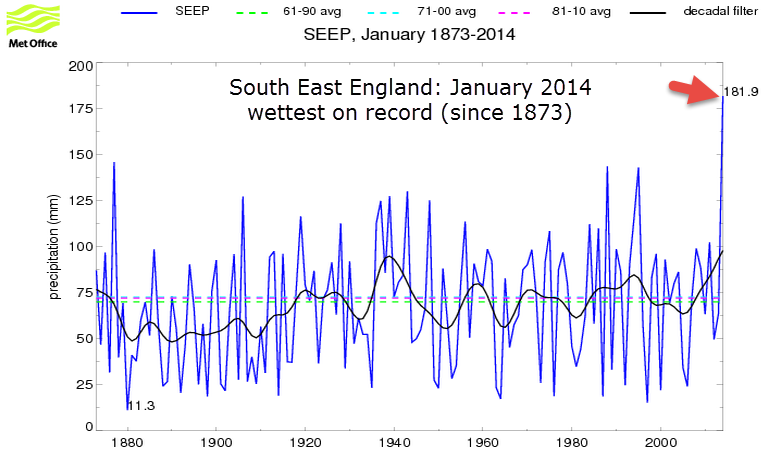 In SE England and Reigate January and February 2014 were 260% and 274% wetter than average respectively (MetOffice). Of the remaining months March, April, June, July, September and December were at or below average. 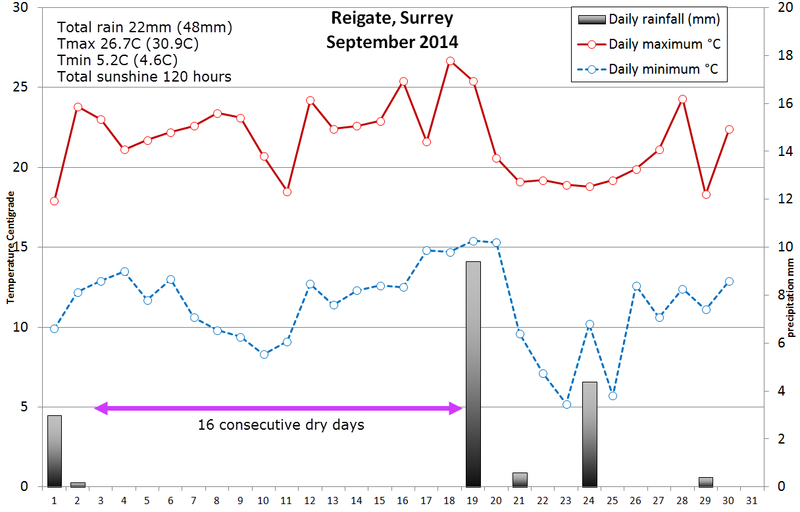 September in Reigate was particularly dry with only 18mm of rain, compared to the average annual SE total nearer 80mm. Nevertheless, despite these dry months for SE England 2014 was the 3rd wettest year on record, mainly due to the exceptional rain totals in the first 2 months. 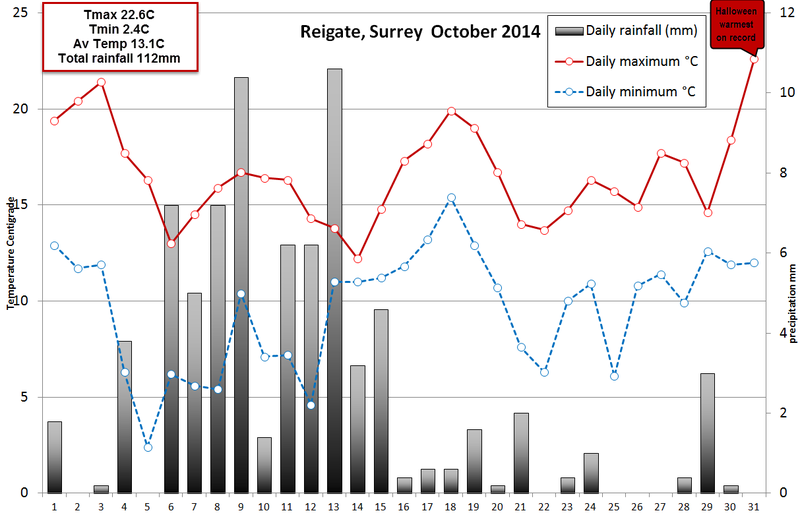 From the rain chart below it is notable that for the second year running Friday is the wettest day of the week in Reigate, Fridays delivering 20% of our rain in 2014. There have been studies showing that this effect of wet ends to the week is due to the build up of aerosol pollution during the commuting week. This encourages the formation of condensation nucleii and higher rainfall totals on friday…it’s a theory worth pursuing because this is the second year running showing this effect in Reigate. 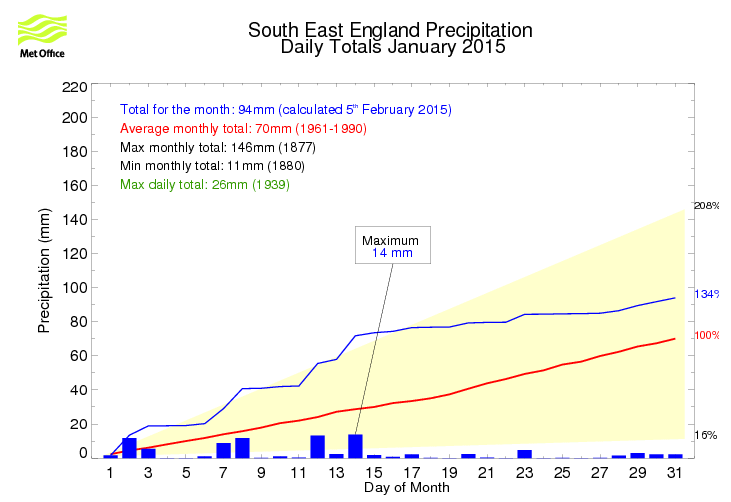 The other chart shows that southerly winds (SE-SW) brought most rain to Reigate in 2014. This continues the trend from 2013 where southerly winds from SW to SE similarly accounted for the vast majority of rain arriving in Reigate. which is the wettest day of the week 2014? 2014 was the warmest year on record according to the Central England Temperature record stretching back to 1772. 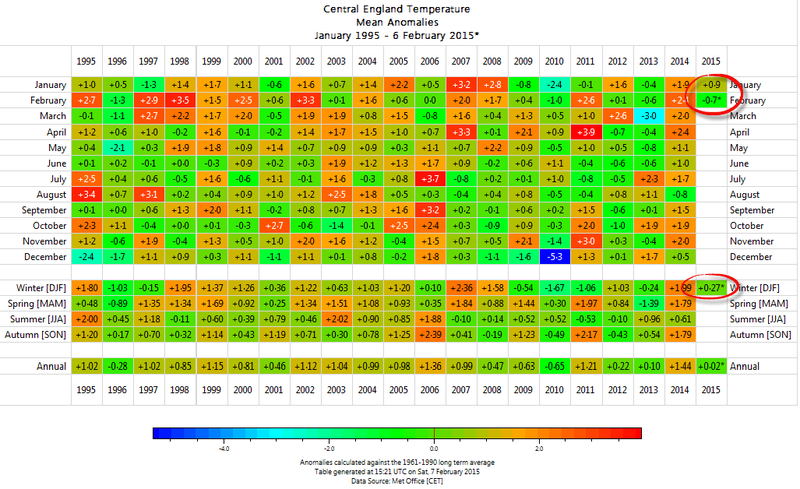 The UK mean temperature for 2014 was 9.9C, 1.1C above the 1981-201 average and 1.47C above the longer term CET average. 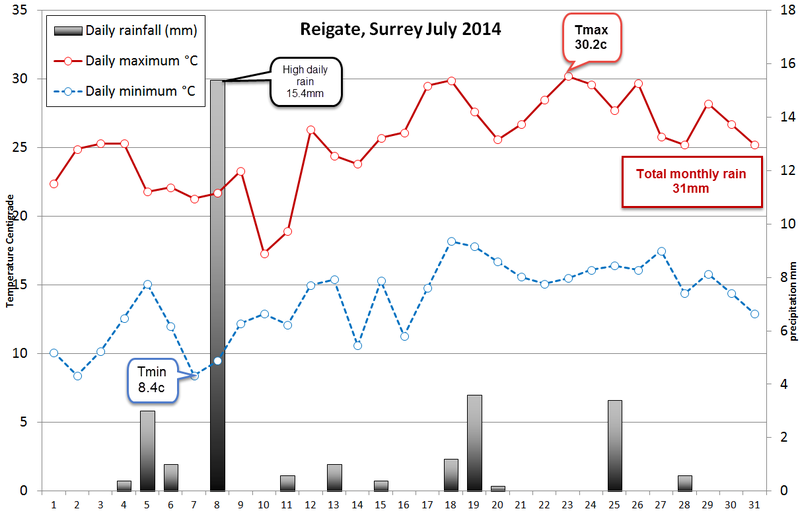 The Reigate mean temperature for 2014 was 11.5C, with a max 30.2C (23/07) and min -2.9C (31/12). The temperature record was broken by stealth and not by extreme values. 11 months of 2014 remained above the long term average. 4 months exceeded 2C above average, a further 7 months were above or very near 1C above average and only August dipped below courtesy of extra-tropical storm Bertha. Extreme heat was mostly absent, as was extreme cold. 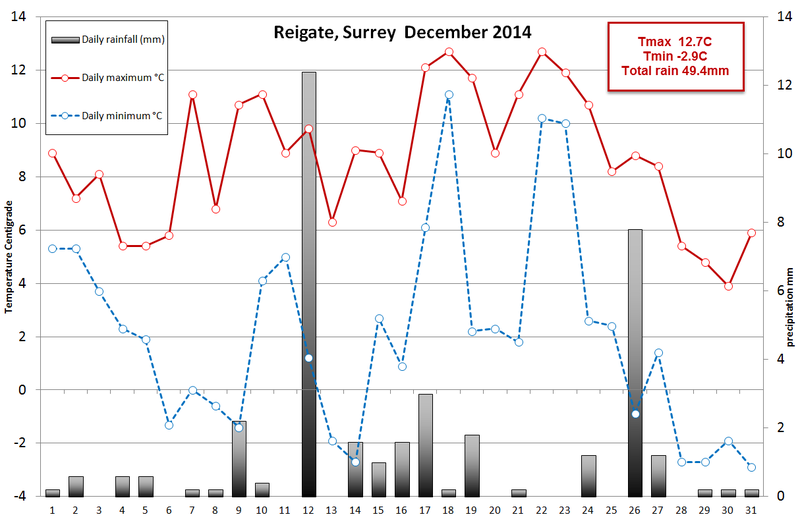 There was no snowfall in Reigate during 2014 and a notable absence of frost until some crisp days during December. 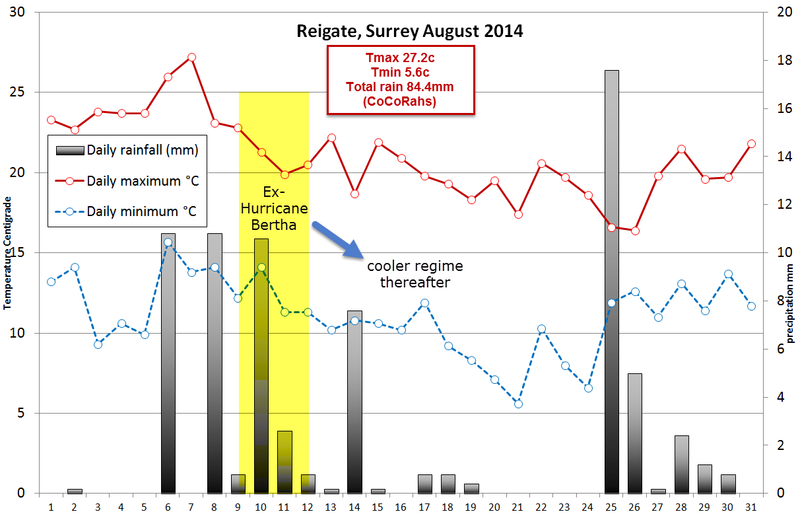 The annual ring chart below for Reigate also shows how August dipped significantly from the curve. The rest of 2014 however was much warmer, resuming the upward temperature trend globally after the hiatus or temperature pause over the last 18 years. Nevertheless, it wasn’t the warmest year for every part of the UK and a useful chart by Ed Hawkins (climate scientist Reading Uni @Ed_Hawkins http://www.met.reading.ac.uk/~ed/home/index.html ) reveals that parts of the UK had a cooler year than others and their warmest annual temperature record, technically, has yet to fall. The animation below shows Europe bathed in above-average anomalous temperatures for the entire year, except momentarily dipping around August. 2014 started stormy and windy. The 3 month mean pressure charts below shows the mean pressure pattern during early 2014 and illustrates the air flow yielding our stormy and wet Jan and Feb: note the strong SW winds that result from the location of the LOW pressure in the Atlantic near Iceland up against the strong Azores high to the south creating a steep pressure gradient and resultant high winds. This situation yielded a positive North Atlantic Oscillation which correlates with a warm, stormy wet winter. Contrast the winter chart with the rather slack flow of 2014 summer. These are mean sea level pressure charts for those 3 months seasons. 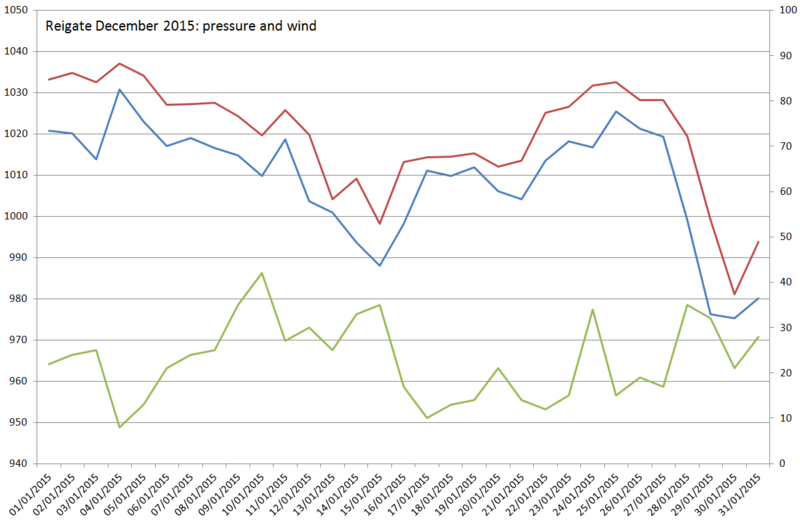 The charts below show wind regime and gusts in Reigate during the year. The highest gust of 52mph occured on 25 January. In August the notable Ex-Hurricane Bertha, despite limited realtime impacts on the UK, delivered a sting in her tail by lowering temperatures across the UK in her wake by introducing a cooler-than-average NW flow for August. 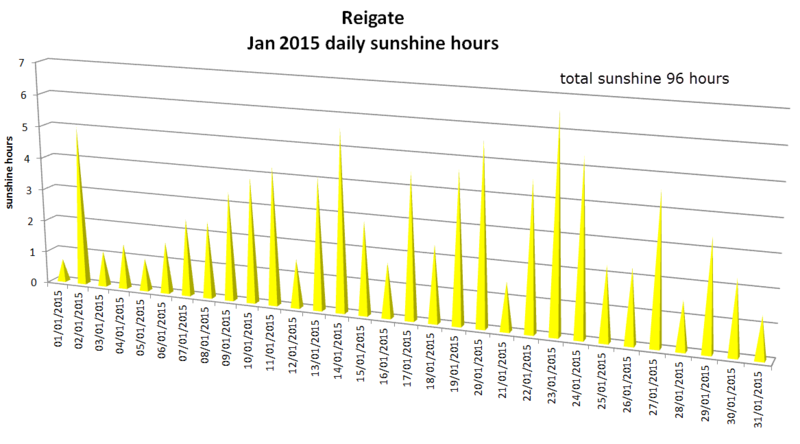 Finally, Reigate had 1560 hours of sunshine in 2014. 2014 was a sunny year though not outstandingly so. December was notably sunny for the time of year with over 100 hours of sunshine, over 160% more sunny than usual! 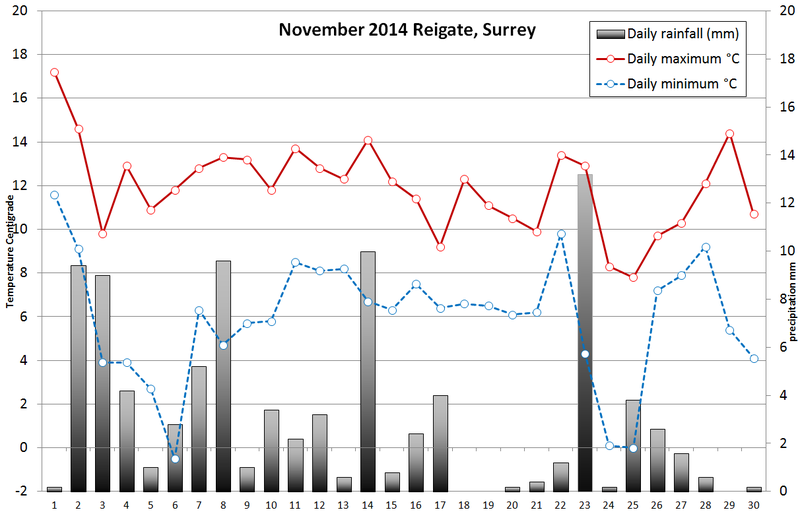 November weather in Reigate and the SE was rather dull and uneventful in Reigate but the meteorology going on more widely was fantastically interesting! November was considerably warmer than average. In the UK November turned out a whopping 2C warmer than the long term CET record. In addition some areas in the south recorded 200% more rainfall than average. Our anomalously warm and wet November was due to our weather being dominated by warm moist southerly winds as a trough sat in the Atlantic and a fairly strong blocking high dominated Russia and occasionally Scandinavia. The northern hemisphere flow encouraged blocking further east and a trough to the west of the UK. The blocking high pushed LOW pressure in the Med that fed warm moist winds up to the UK (warm air advection). Occasional Atlantic fronts caused heavy rain when cooler air on cold fronts advected in from the west to meet this moist flow. Heavy November rain in the south was caused by this process. Nevertheless, the usual scaremongering forecasts in the press failed to materialise. A split jetstream assisted the warm moist feed across much of Europe and led to torrential rain and flooding along south facing coasts in Italy and S France. To a lesser extent this also occurred in the UK with highest rainfall anomalies found in the south and SE. Globally November was one of the warmest on record too. However, the US and Canada recorded one of the earliest coldest and snowiest Novembers on record. The upper air patterns plunged cold Arctic air into North America and, when this frigid polar air crossed the warm Great Lakes, it produced tremendous falls of Lake Effect snow over northern New York State, especially around Buffalo. Autumn for the UK as a whole was the third warmest in the record going back to 1910. Autumnal rainfall was just a tad below average because September was a very dry month. October and November were well above average for rainfall. The SE came out average or just above average for rain for the whole of the Autumn. Globally November’s warmth and climate extremes caused the climate change debate to reignite. The graphs below speak for themselves. Our November was dominated by our first HIGH ALTITUDE BALLOON launch. The experience of launching our first exploration into near space brought it home to us how thin our atmosphere is, how quickly it is to escape from and thus how fragile it is. We live perilously close to utterly hostile environments… the views of Earth brought back from our stratospheric balloon were both sensational but somehow frightening in the context of rapid climate change on the only earth we have. In the UK as a whole October 2014 was the equal-tenth warmest October for the UK in a series since 1910 according to Central England temperatures (CET). Globally, unconfirmed data suggests that October might be the warmest on record. October 2014: warmest on record? In Reigate much of the heaviest rain came in the first half of October in big convective downpours that were hit and miss. Some tornadoes were reported across the UK and these were quite damaging in places further North. We have yet to record a tornado in Reigate. Tornados are extremely tricky to forecast but several agencies try it.. usually the MetOffice do not mention tornadoes in their forecasts because they are so hit and miss, even when potential is there. Estofex, UKWW and SkywarnUK are agencies that have an eye on tornadic and severe weather conditions in the UK that RGSweather follows carefully.